What Day Of The Week Was September 7, 1979? 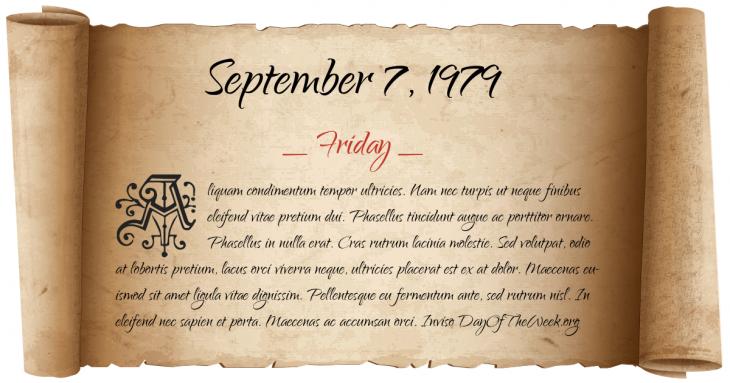 September 7, 1979 was the 250th day of the year 1979 in the Gregorian calendar. There were 115 days remaining until the end of the year. The day of the week was Friday. A person born on this day will be 39 years old today. If that same person saved a Half dollar every day starting at age 5, then by now that person has accumulated $6,322.50 today. The Chrysler Corporation asks the United States government for USD $1.5 billion to avoid bankruptcy. The Entertainment and Sports Programming Network, better known as ESPN, makes its debut. Who were born on September 7, 1979?